EDF Energy are the largest producer of low-carbon electricity and one of the leading energy suppliers in the UK. Constantly working towards supplying energy in a way that achieves ‘Zero Harm to People’, EDF have a real commitment to business ethics, responsibility and fairness. 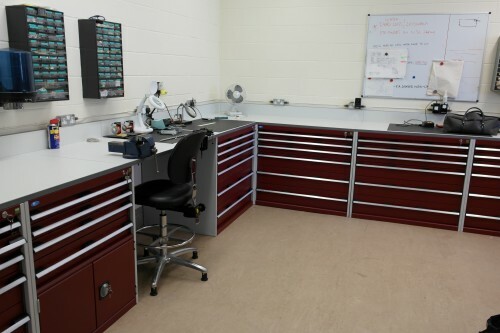 EDF Energy required recycling units to help them implement a new waste disposal system within their facility and had unsuccessfully searched for a product that met their standards of aesthetics, custom-capabilities, ergonomics and size. Impressed by a commitment to bespoke solutions, EDF directly commissioned CSI to design and supply a completely new product that would match their requirements. Key to this project was understanding the look and functionality of the desired end product. CSI held meetings with the facilities manager to properly comprehend these and constantly liaised with the client throughout the design process to ensure the finished product exactly matched their specifications. To guarantee EDF the best price on final production, CSI made enquiries using an extensive network of manufacturers and suppliers. Adapting previous manufacturers designs, different solutions were researched and presented to give EDF a choice in the final supplied product. This involved the manufacture and supply of a prototype for trial purposes. Following this trial, it was realised that the unit had to become larger to contain more recycling while also becoming lighter to promote ease-of-use. A larger model with lightweight aluminium internal bins was then developed. To match EDF’s desires in terms of aesthetics and to encourage staff use, an appealing and co-ordinated colour scheme was applied to the unit. The end product was a lightweight and colour coded all in one recycling unit containing 4×60 litre aluminium bins for cardboard, paper, plastics and metals with custom capabilities to suit EDF’s corporate image. CSI supplied 25 of these units to EDF with more to follow as the recycling system is implemented company-wide. 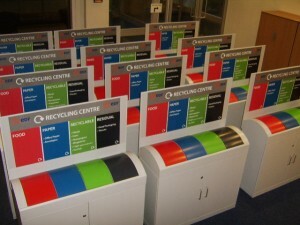 Scope of Works : Design and supply of custom made recycling units. Through working with EDF, CSI was able to design and supply a recycling unit that has helped EDF to implement the desired waste disposal system in their facility, giving them a visible commitment to recycling. 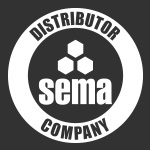 This has, in turn, reduced EDF’s costs in domestic cleaning, allowing them to achieve their aim of decreasing company costs to the end benefit of their customers. William Clarkson, Contract Manager, EDF Energy.